Web Design Firms Eliminated. Enter Automation Software. The past few years of growth in web design has blown away even the most prolific design firms such as Influce, but there are many others as well. These designs have changed throughout the years. If you want you could check out these web design trends to see how much times have changed. So much that they’re now non-existent. The game is all about automation and freelancing now. Today’s idea will be about creating software for the future of web design. I know, there are several companies that are already doing this but there were also other search engines when Google first launched. So as mentioned in the first Free Ideas post, execution is the game and not the ideas. Digital publishing revolutionized print publishing. Now, web design is being revolutionized in a similar way by automation software. You can check out something like this toronto web design services to give you a better idea of how web design is being revolutionized. These words are beginning to sound like “digital photographers should learn how to shoot film first”. On this note, it can actually help but digital photography is a lot faster and most millennial photographers are not going to know a thing about film. That doesn’t make their work lower quality in fact, it allows them to focus on other things and not get bogged down with technical stuff. Less than 10 years ago without coding knowledge you were doomed for a professional website design. Either you had to learn both developing and design or hire someone that knew what you didn’t. The beginning of this change began with companies like WordPress and Squarespace around 2003, which are known as content management systems (CMS). The early days of this software was very limited. Nonetheless, it really paved the way for those wanting to get online right away with little coding knowledge. This was when blogging exploded. Then came social media. A totally different game that when done correctly can drive massive traffic to blogs. Mobile arrived and dominated the game by making all of this so much easier. So, everyone is now on their mobile device and on social media. There’s really no excuse to not getting your content out there today. In more recent years, we’ve had flat design and responsive design which created app-like experiences on a desktop version of a website. With mobile, the importance having an app could not be ignored but not everyone could afford an app. So how about an app-like website? There are many great examples of this like Medium and the Hemingway App. Before content management systems only web designers and web developers created websites, that’s it. With a CMS anyone without any coding knowledge could get a website up and running. In order to create a personal experience though, you needed to know at least a little bit of code and how HTML, CSS and JS worked within that CMS. What amazes most out of all this innovation is that very few people are aware of it and, why does it take so long for people to accept change? The end of code means a lot more people are going to be able to design and redesign their websites with ease. Isn’t it awesome to be able to focus on the design of your site and forget about code? Meaning the code was done for you? There are several companies taking web design in that direction and one of them is Adobe Muse. Adobe Muse will be providing responsive web design without the need for code. Responsive design has been around for a while now but no in Adobe Muse. There is a problem with responsive design. Although these designs come with a few layout options according to screen size, they do not allow for originality and full-customization. Muse promises to deliver that, without the knowledge for code. Macaw is another company that is working to eliminate code. “Stop writing code, start drawing it”, means that there’s more of an image focus and exactly what you see in the program is the way your web page will look like (WYSIWYG). It’s still in its early stages and like most projects in that stage there’s still more refining to do but it’s great to create quick mockups for your site. The Grid is arguably the first company to come up with intelligent web design that eliminates the need of knowledge of coding. It’s done for you design. There are recipes that already exist in web design, to the point that artificial intelligence can take care of it. It will be interesting how this particular project unfolds. Read a review on The Grid here. Responsive design has also been overlapping with interactive design. Where the design changes according to a user generated action. For example, when you scroll down a “one-page” website you’re awed by the multiple animations. I think this will prove to be important for visual storytelling, where you can tell a story on your home page. That’s only the beginning. A great example of this is Web Flow. See for yourself in the video below. Interactive design goes the extra mile to engage more senses like touch. The iWatch is a great example. It can work with your heartbeat, vibrate accordingly and provide some food for thought about your health. UX stands for User Experience. 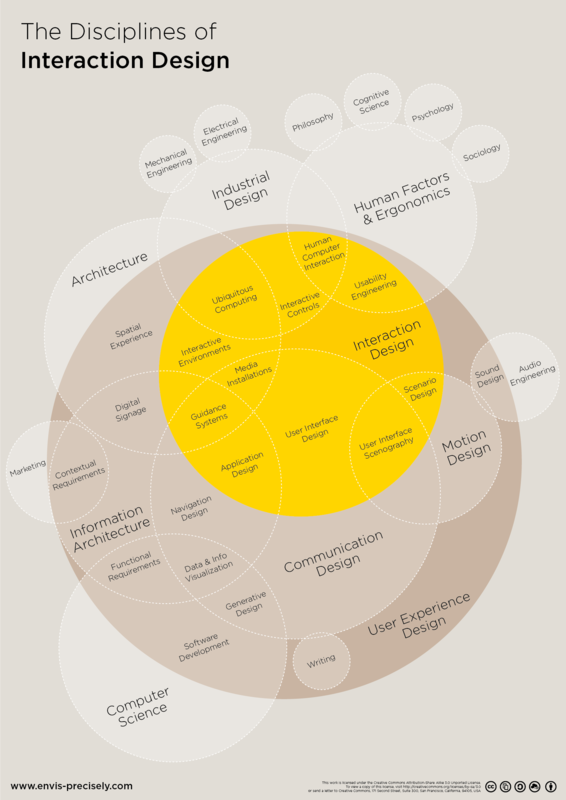 The definition of UX is also changing. The experience is no longer restricted to a flat, two-dimensional surface. For example, what is the UX of an iRobot vacuum? Or pants that tell you to eat a salad today and watch your wait? Think about the places where people are using Google Maps, Pandora and almost every other app now? They’re not only on smartphones, tablets and computers anymore. They are now on watches, bathroom mirrors, glass, windows, refrigerators, in our cars and a lot more. All in all artificial intelligence and software will never replace designers but think about how this problem relates to photography, for example. Photographers, who have received professional training, went to university for a minimum of four years, did various internships and so on. Then came Instagram with filters. Instead of embracing (I’m part of it) social media and leveraging the sharing possibilities, many photographers shunned the photographs newbies were producing as not being an art form. I think in a similar way designers can be shunning new software and saying it’s not real design. Just a sign of caution. I do have a heavy background in design and have been trained since 1999 so I can relate. In the entrepreneurial spirit that every designer should have, why aren’t we innovating like these other great companies and making the design process better on a global level? Design has a beautiful future. Need expert coaching? Visit my Contact Page to learn more. An Idea Per Day? Ideas Are Cheap. New Segment of Ideas Daily. Follow Your Dreams…But First Do This One Thing.